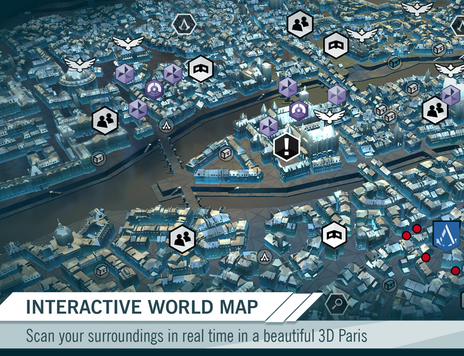 Overview: Playing Nomad Missions near a Landmark reveals exclusive, high rewards. Select Category: Browse Sequences, Memories and CO-OP Missions to view completed challenges and earned rewards. Menu: Select an entry from the list to get more information about it. Modifiers: Select an item to see how equipping it will change Amo's abilities in Assassin's Creed Unity. Overview:Review Assassin's Creed Unity Tutorials, E-manual Casefiles and Database. List: Browse the list to find more information about anything in Assassin's Creed Unity. Map: You can also access the Database by selecting one of its entries directly on the map. Get Exclusive Content From the Database. Get Five Additional Recruitment Slots. Unlock an exclusive Initiates Avatar.